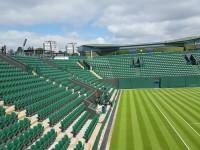 You are on Gate 5 and Routes to the Court. Skip to the next section. 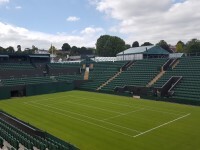 For information about Gate 5 and the route to No.2 Court please click here (opens in new tab). 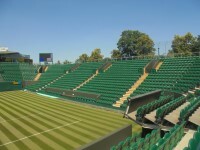 You are on Access to No.2 Court Seating. Skip to the next section. 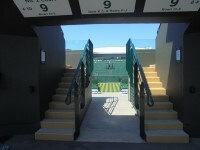 There are gangways located around the edge of No.2 Court to provide access to the seating. 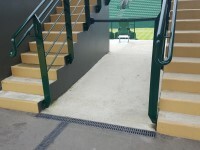 There is step free access on the paths around No.2 Court. 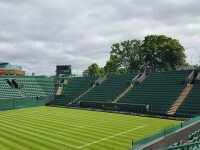 There are between 10 to 12 clearly marked steps with handrails on both sides leading from the Gangways to the seating areas. The number of steps varies depending on the Gangway used. 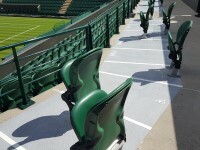 There is a very slight slope at Gangways 8 and 9 which can be used to access the front of the seating area. 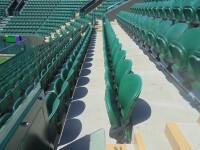 Once in the seating area there are 1 to 15 plus clearly marked steps to access the rows of seating. You are on Gangway 8 and 9. Skip to the next section. 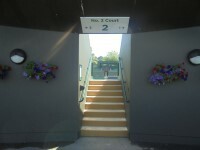 Entrances 8 and 9 are located on the south side of No.2 Court. 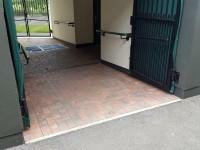 Both entrances are 160cm wide. 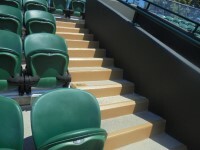 There is a very slight ramp leading up to the designated seating area. 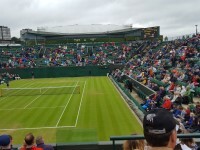 During The Championships there is a steward stationed at both entrances. You are on Designated Seating. Skip to the next section. 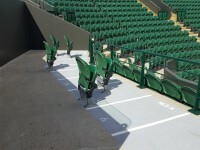 Wheelchair users have a designated accessible seating area. 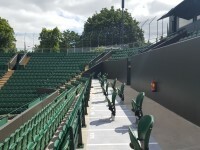 The designated accessible seating area is accessed from the concourse through gangways 8 - 9, located on the south side of No.2 Court. 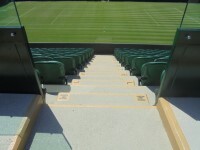 There are easy slopes leading to the designated seating through the gangways. 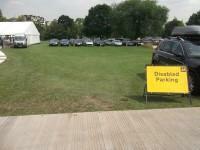 There are 20 designated wheelchair spaces. There are 20 spaces for a companion to sit behind you. 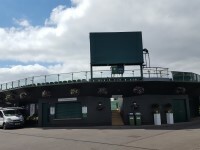 The accessible toilets are located opposite entrances 8 and 9 and opposite gates 4 and 5. You are on Accessible Toilet(s) (No.2 Court - Gangways 4 and 5). Skip to the next section. 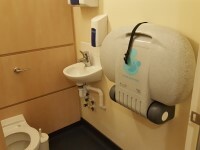 This accessible toilet is located next to No.2 Court opposite gangways 4 and 5. 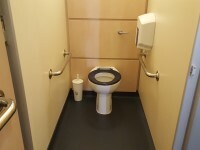 This accessible toilet is approximately 20m (21yd 2ft) from the Gangways 8 and 9. 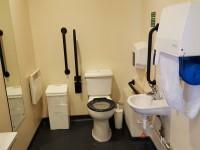 The dimensions of the accessible toilet are 151cm x 220cm (4ft 11in x 7ft 3in). The lateral transfer space is 64cm (2ft 1in). 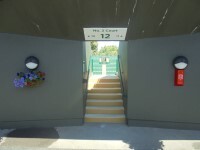 You are on Standard Toilet(s) (No.2 Court -Gangway 8 and 9). Skip to the next section. 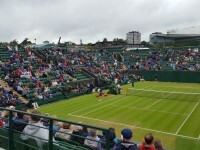 The female and male toilet facilities that were surveyed are located opposite gates 8 and 9. 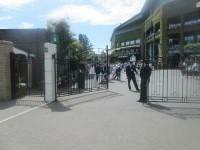 The female and male toilets are approximately 11m (12yd 1in) from the gates 8 and 9. You are on Accessible Toilet(s) (No.2 Court - Gangways 8 and 9). Skip to the next section. This accessible toilet is located next to No.2 Court opposite gangways 8 and 9 and next to The Bakery kiosk. 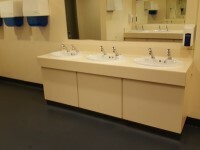 The dimensions of the accessible toilet are 200cm x 200cm (6ft 7in x 6ft 7in). The lateral transfer space is 129cm (4ft 3in). Disposal facilities are not available in the toilet. 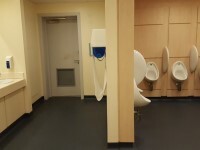 You are on Standard Toilet(s) (No.2 Court -Gangway 4 and 5). Skip to the next section. 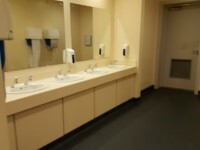 The female and male toilet facilities that were surveyed are located opposite gates 4 and 5. 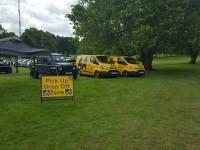 The female and male toilets are approximately 20m (21yd 2ft) from the gates 8 and 9. 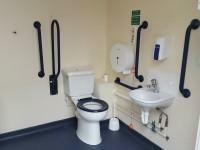 An ambulant toilet cubicle with wall mounted grab rails is not available. 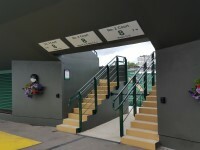 You are on Level Change (No.2 Court - Gangway 4 and 5 Toilets). Skip to the next section. 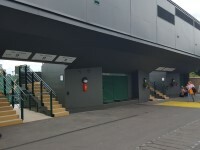 The ramp/slope is located opposite Gangway 4 and 5.